RegAMoney.com: As regular listeners of the Reg.A Money Show know from our previous show, robotics medical device maker Myomo, Inc. recently made big news in the Regulation A+ industry by becoming the first Reg.A+ offering to be listed on the New York Stock Exchange (NYSE). 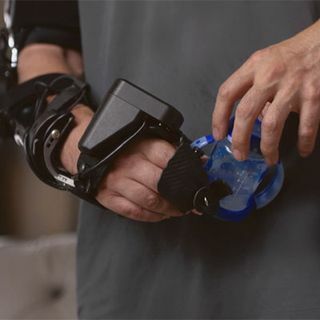 The Cambridge, Massachusetts-based company was spun out of MIT in 2006, and develops robotic braces that can help people regain the use of partially paralyzed or weakened arms and hands. Myomo successfully raised $5 million ... Maggiori informazioni by selling 665,498 shares of its common stock to the public at $7.50 per share under stock symbol “MYO”. How did they do it? Shares were sold to the public through an equity crowdfunding campaign conducted on the website of Banq, an online investing platform run by TriPoint Global Equities, the lead managing selling agent and bookrunner administering Myomo’s securities offering with CrowdfundX functioning as the digital marketing agency of record for the offering. On this episode of the “Reg.A Money Show”, we interviewed Myomo CEO Paul Gudonis, who provided his insight on his company’s experience with Reg.A+, from the initial stages to their successful and impressive listing on the NYSE. Mr. Gudonis touches on some extremely important points that anyone in the RegulationA+ realm should know and the advice he gives to potential Reg.A+ issuers is absolutely invaluable!